PKP Polish Railway Lines signed two contracts with a total value of PLN 1.25 billion (EUR 291.2 million) for the modernisation of Dęblin – Lublin. 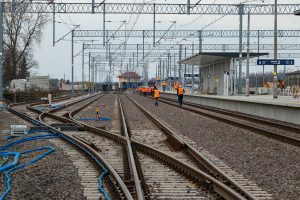 The infrastructure manager and Budimex signed a PLN 616.4 million (EUR 143.6 million) for the modernization works on Dęblin – Nałęczów section, including the rehabilitation of Nałęczów station. With Track Tec Construction was signed a PLN 627.7 million (EUR 146.2 million) contract for the modernisation of Nałęczów – Lublin section, including the modernisation of Lublin station. Under the project, the Lublin node will have a new connection with Stalowa Wola line with a further link to Warsaw. Thanks to this solution, the passenger trains will be improved as the freight trains will not have to enter Lublin station. The two contracts cover the scope of all works that were not carried out and were included in the contract innitialy signed with Astaldi. In the autumn of 2018, PKP PLK ended the contract with Astaldi because, “despite calls”, the company did not perform the needed construction works on Dęblin – Lublin modernisation. The works will be restarted this month and it is expected that the trains will use this connection at the end of 2020.